My Heat Echanger is Broken, How dangerous is it? - Can It Be Fixed? Why do all furnaces eventually develop these cracks? Any furnace from any brand made installed by any company will eventually develop a crack in the heat exchanger. It’s just a property of these furnaces! The heat exchanger is meant to hold the combustion from your fuel source in-line with the air that flows through your home. As the combustion happens, the metal of the exchanger expands until it cools off again and contracts. All of the expanding and contracting stresses the metal and eventually leads to failure of the Heat Exchanger. Although a poorly designed duct system can also contribute to your heat exchanger failure by not allowing proper air flow through the furnace Heat Exchanger the metal can heat up to temperatures it is not intended to operate at. What do these cracks look like? These cracks above are very serious to the health of you and your family. They were from a furnace that was about 10 Years old. How Can You know when a Heat Exchanger Has Failed? A heat exchanger must be visually inspected on a regular basis. Visual observation of light or water passing through the break/crack is positive confirmation of a crack or hole in a heat exchanger. What is the danger of a Broken Heat Exchanger? Cracks in the heat exchanger or “Fire Box” is no laughing matter. 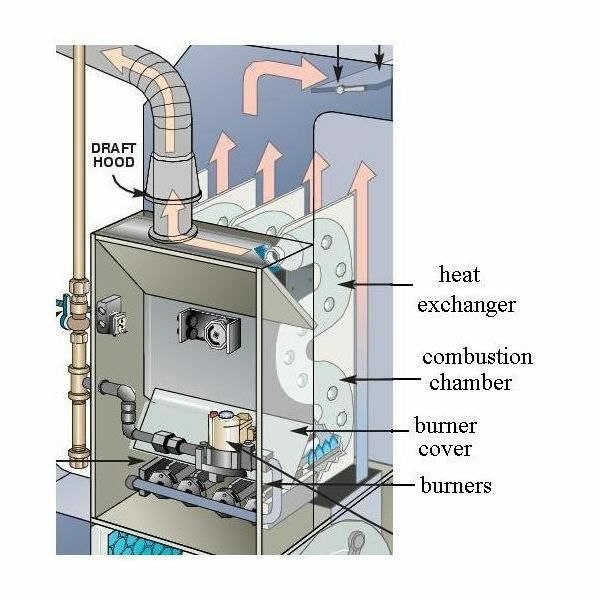 There are two major dangers with having a broken heat exchanger: The first is the potential for the furnace to catch fire and potentially spread to other parts in the home. The second danger is carbon monoxide emissions. Flame-outs occur when an incorrect mixture of gas and air get mixed and combusted in the heat exchanger. Uncombusted gas builds up in the exchanger until it reaches a high enough volume to be explosive. When that point is reached, the gas combusts and forces flames and air pressure out of any accessible hole in the heat exchanger including the cracks. Furnace fires are fairly common. Carbon Monoxide poisoning is a scary thing. It can also be a scare tactic used to entice you to purchase a new furnace. But how bad is it really? There must be an improper mixture of air and gas to produce Carbon Monoxide. There must be a crack or leak from the heat exchanger into the home air flow. The inducer motor that pulls air through the heat exchanger must be not functioning properly. Although you should certainly not wait until your carbon monoxide detector goes off to determine if your heat exchanger is broken, if you do get an alarm go off, it is a strong sign that damage is present. Carbon monoxide is a byproduct of the combustion process, and it can seep through the cracks of a damaged heat exchanger. Turn your Furnace OFF and Contact your local Heating Company right away if your carbon monoxide detector goes off. Combustion gases leaking from a cracked heat exchanger can cause frequent headaches as well as flu-like symptoms. Combustion pollutants, such as carbon monoxide, nitrogen dioxide and sulfur dioxide, can cause eye and nose irritation, disorientation, sleepiness and nausea. If you experience these symptoms only when you’re at home and the symptoms go away when you leave your home, or if you share these symptoms with other people in your home, have your home heater inspected immediately. Although these symptoms can come from other sources, persistent symptoms may suggest a cracked heat exchanger. If you feel that you’ve been taken advantage by another company, give us a call! We offer a free Second Opinion to give you peace of mind when it comes to your furnace safety. We service the Ventura County, Los Angeles, San Fernando Valley and Santa Clarita areas.